What does SME stand for? What does SME mean? This page is about the various possible meanings of the acronym, abbreviation, shorthand or slang term: SME. SME or Denník SME is the most widely read mainstream broadsheet in Slovakia. Its target group is very wide, but officially it focuses on readers in bigger cities and agglomerations. Its circulation in December 2006 was 76 590. It appears 6 times a week. It is issued by Petit Press, a. s. and its editor-in-chief is Matúš Kostolný. The former managing editors were Martin M. Šimečka and founding editor-in-chief was Karol Ježík. The newspaper was founded in mid-January 1993 by a group of journalist of the well-established daily Smena, who left that daily due to differences over editorial policies and control. They accused the government under Vladimír Mečiar of having the Smena's editor-in-chief removed from his post indirectly by means of political influence. The newspaper was oriented strongly against governments under Vladimír Mečiar and in favour of other governments. It is a rather centrist to right-wing newspaper now. In 1995, the newspaper merged with the daily Smena and in 2004 with another major Slovak daily – the daily Práca - "Work". 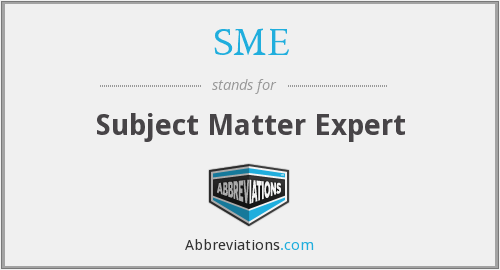 Couldn't find the full form or full meaning of SME? Know what is SME? Got another good explanation for SME? Don't keep it to yourself! "SME." Abbreviations.com. STANDS4 LLC, 2019. Web. 22 Apr. 2019. <https://www.abbreviations.com/SME>.